KIEV, Ukraine -- The Obama administration criticized Ukrainian President Viktor Yanukovych over the conduct of local elections, saying they "did not meet standards for openness and fairness." PM Mykola Azarov, who heads the Party of Regions, called the election "honest and fair." Mr. Yanukovych's allies won the biggest overall share of votes Sunday in races to choose mayors and regional councils, according to an exit poll, but opposition parties and election observers are crying foul, alleging widespread violations. The vote was seen as a test of Mr. Yanukovych's democratic credentials following his victory in presidential elections in February. Since taking office and building closer ties with Russia, the president has been accused of trying to replicate a Russian style of authoritarian rule by clamping down on the opposition and the media. A statement issued Wednesday by the U.S. Embassy in Kiev said Sunday's elections were a step backward from the February vote, which was widely judged free and fair. It criticized recent changes to the election law that benefited the president's Party of Regions and "numerous procedural violations on election day" that were noted by international and domestic monitors. The Washington-based National Democratic Institute on Tuesday said it had observed a "deterioration in Ukraine's election environment." Opora, a nonpartisan Ukrainian election watchdog funded by NDI, reported pressure on opposition candidates by state officials to drop off the ballot as well as numerous cases of vote-buying and repeat voting. 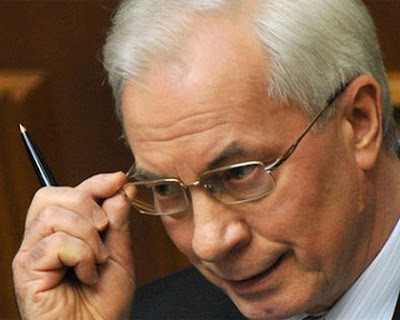 Prime Minister Mykola Azarov, who heads the Party of Regions, called the election "honest and fair." Mr. Yanukovych, in a televised address Tuesday, acknowledged "technical flaws" but declared the elections over and urged the winners to get to work. Lawmakers from former Prime Minister Yulia Tymoshenko's opposition party physically blocked the speaker's rostrum in parliament on Wednesday, preventing the body from convening. They demanded that a special parliamentary committee be set up to investigate alleged violations. A group of 10 opposition parties released a statement saying the vote was "neither democratic, nor free." Official results of the elections are expected later this week. An exit poll gave Mr. Yanukovych's Party of Regions 36% support, against 13% for Ms. Tymoshenko's party. Thanks for your updates on legislative activities in Kiev. We have heard some news of a vote to close international adoptions - is that accurate, and how does it impact US families trying to adopt in Ukraine?